"Quick boot" redirects here. For the feature of the Quarterdeck memory manager, see Quickboot (QEMM). This article is about bootstrapping operating systems. For the general concept, see Bootstrapping. For other uses, see Boot (disambiguation). In computing, booting is starting up a computer or computer appliance until it can be used. It can be initiated by hardware such as a button press or by software command. After the power is switched on, the computer is relatively dumb and can read only part of its storage called read-only memory (ROM). There, a small program is stored called firmware. It does power-on self-tests and, most importantly, allows accessing other types of memory like a hard disk and main memory. The firmware loads bigger programs into the computer's main memory and runs it. In general purpose computers, but additionally in smartphones and tablets, optionally a boot manager is run. The boot manager lets a user choose which operating system to run and set more complex parameters for it. The firmware or the boot manager then loads the boot loader into the memory and runs it. This piece of software is able to place an operating system kernel like Windows or Linux into the computer's main memory and run it. Afterwards, the kernel runs so-called user space software – well known is the graphical user interface (GUI), which lets the user log in to the computer or run some other applications. The whole process may take seconds to tenths of seconds on modern day general purpose computers. Restarting a computer also is called reboot, which can be "hard", e.g. after electrical power to the CPU is switched from off to on, or "soft", where the power is not cut. On some systems, a soft boot may optionally clear RAM to zero. Both hard and soft booting can be initiated by hardware such as a button press or by software command. Booting is complete when the operative runtime system, typically operating system and some applications,[NB 1] is attained. The process of returning a computer from a state of hibernation or sleep does not involve booting. Minimally, some embedded systems do not require a noticeable boot sequence to begin functioning and when turned on may simply run operational programs that are stored in ROM. All computing systems are state machines, and a reboot may be the only method to return to a designated zero-state from an unintended, locked state. In addition to loading an operating system or stand-alone utility, the boot process can also load a storage dump program for diagnosing problems in an operating system. Boot is short for bootstrap or bootstrap load and derives from the phrase to pull oneself up by one's bootstraps. The usage calls attention to the requirement that, if most software is loaded onto a computer by other software already running on the computer, some mechanism must exist to load the initial software onto the computer. Early computers used a variety of ad-hoc methods to get a small program into memory to solve this problem. The invention of read-only memory (ROM) of various types solved this paradox by allowing computers to be shipped with a start up program that could not be erased. Growth in the capacity of ROM has allowed ever more elaborate start up procedures to be implemented. There are many different methods available to load a short initial program into a computer. These methods reach from simple, physical input to removable media that can hold more complex programs. Early computers in the 1940s and 1950s were one-of-a-kind engineering efforts that could take weeks to program and program loading was one of many problems that had to be solved. 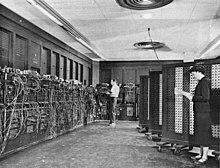 An early computer, ENIAC, had no "program" stored in memory, but was set up for each problem by a configuration of interconnecting cables. Bootstrapping did not apply to ENIAC, whose hardware configuration was ready for solving problems as soon as power was applied. The EDSAC system, the second stored program computer to be built, used stepping switches to transfer a fixed program into memory when its start button was pressed. The program stored on this device, which David Wheeler completed in late 1948, loaded further instructions from punched tape and then executed them. The first programmable computers for commercial sale, such as the UNIVAC I and the IBM 701 included features to make their operation simpler. They typically included instructions that performed a complete input or output operation. The same hardware logic could be used to load the contents of a punch card (the most typical ones) or other input media, such as a magnetic drum or magnetic tape, that contained a bootstrap program by pressing a single button. This booting concept was called a variety of names for IBM computers of the 1950s and early 1960s, but IBM used the term "Initial Program Load" with the IBM 7030 Stretch and later used it for their mainframe lines, starting with the System/360 in 1964. The IBM 701 computer (1952–1956) had a "Load" button that initiated reading of the first 36-bit word into main memory from a punched card in a card reader, a magnetic tape in a tape drive, or a magnetic drum unit, depending on the position of the Load Selector switch. The left 18-bit half-word was then executed as an instruction, which usually read additional words into memory. The loaded boot program was then executed, which, in turn, loaded a larger program from that medium into memory without further help from the human operator. The term "boot" has been used in this sense since at least 1958. IBM System/3 console from the 1970s. Program load selector switch is lower left; Program load switch is lower right. Other IBM computers of that era had similar features. For example, the IBM 1401 system (c. 1958) used a card reader to load a program from a punched card. The 80 characters stored in the punched card were read into memory locations 001 to 080, then the computer would branch to memory location 001 to read its first stored instruction. This instruction was always the same: move the information in these first 80 memory locations to an assembly area where the information in punched cards 2, 3, 4, and so on, could be combined to form the stored program. Once this information was moved to the assembly area, the machine would branch to an instruction in location 080 (read a card) and the next card would be read and its information processed. Another example was the IBM 650 (1953), a decimal machine, which had a group of ten 10-position switches on its operator panel which were addressable as a memory word (address 8000) and could be executed as an instruction. Thus setting the switches to 7004000400 and pressing the appropriate button would read the first card in the card reader into memory (op code 70), starting at address 400 and then jump to 400 to begin executing the program on that card. IBM's competitors also offered single button program load. The CDC 6600 (c. 1964) had a dead start panel with 144 toggle switches; the dead start switch entered 12 words from the toggle switches to the memory of peripheral processor (PP) 0 and initiated the load sequence. 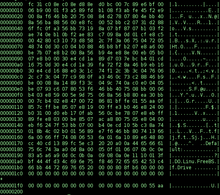 PP 0 loaded the necessary code into its own memory and then initialized the other PPs. The GE 645 (c. 1965) had a "SYSTEM BOOTLOAD" button that, when pressed, caused one of the I/O controllers to load a 64-word program into memory from a diode read-only memory and deliver an interrupt to cause that program to start running. The first model of the PDP-10 had a "READ IN" button that, when pressed, reset the processor and started an I/O operation on a device specified by switches on the control panel, reading in a 36-bit word giving a target address and count for subsequent word reads; when the read completed, the processor started executing the code read in by jumping to the last word read in. A noteworthy variation of this is found on the Burroughs B1700 where there is neither a bootstrap ROM nor a hardwired IPL operation. Instead, after the system is reset it reads and executes opcodes sequentially from a tape drive mounted on the front panel; this sets up a boot loader in RAM which is then executed. However, since this makes few assumptions about the system it can equally well be used to load diagnostic (Maintenance Test Routine) tapes which display an intelligible code on the front panel even in cases of gross CPU failure. In the IBM System/360 and its successors, including the current z/Architecture machines, the boot process is known as Initial Program Load (IPL). IBM coined this term for the 7030 (Stretch), revived it for the design of the System/360, and continues to use it in those environments today. In the System/360 processors, an IPL is initiated by the computer operator by selecting the three hexadecimal digit device address (CUU; C=I/O Channel address, UU=Control unit and Device address[NB 2]) followed by pressing the LOAD button. On the high end System/360 models, most[NB 3] System/370 and some later systems, the functions of the switches and the LOAD button are simulated using selectable areas on the screen of a graphics console, often[NB 4] an IBM 2250-like device or an IBM 3270-like device. For example, on the System/370 Model 158, the keyboard sequence 0-7-X (zero, seven and X, in that order) results in an IPL from the device address which was keyed into the input area. The Amdahl 470V/6 and related CPUs supported four hexadecimal digits on those CPUs which had the optional second channel unit installed, for a total of 32 channels. Later, IBM would also support more than 16 channels. The IPL function in the System/360 and its successors, and its compatibles such as Amdahl's, reads 24 bytes from an operator-specified device into main storage starting at real address zero. The second and third groups of eight bytes are treated as Channel Command Words (CCWs) to continue loading the startup program (the first CCW is always simulated by the CPU and consists of a Read IPL command, 02h, with command chaining and suppress incorrect length indication being enforced). When the I/O channel commands are complete, the first group of eight bytes is then loaded into the processor's Program Status Word (PSW) and the startup program begins execution at the location designated by that PSW. The IPL device is usually a disk drive, hence the special significance of the 02h read-type command, but exactly the same procedure is also used to IPL from other input-type devices, such as tape drives, or even card readers, in a device-independent manner, allowing, for example, the installation of an operating system on a brand-new computer from an OS initial distribution magnetic tape. For disk controllers, the 02h command also causes the selected device to seek to cylinder 0000h, head 0000h, simulating a Seek cylinder and head command, 07h, and to search for record 01h, simulating a Search ID Equal command, 31h; seeks and searches are not simulated by tape and card controllers, as for these device classes an 02h command is simply a sequential read command, not a Read IPL command. The disk, tape or card deck must contain a special program to load the actual operating system or standalone utility into main storage, and for this specific purpose "IPL Text" is placed on the disk by the stand-alone DASDI (Direct Access Storage Device Initialization) program or an equivalent program running under an operating system, e.g., ICKDSF, but IPL-able tapes and card decks are usually distributed with this "IPL Text" already present. Minicomputers, starting with the Digital Equipment Corporation (DEC) PDP-5 and PDP-8 (1965) simplified design by using the CPU to assist input and output operations. This saved cost but made booting more complicated than pressing a single button. Minicomputers typically had some way to toggle in short programs by manipulating an array of switches on the front panel. Since the early minicomputers used magnetic core memory, which did not lose its information when power was off, these bootstrap loaders would remain in place unless they were erased. Erasure sometimes happened accidentally when a program bug caused a loop that overwrote all of memory. Other minicomputers with such simple form of booting include Hewlett-Packard's HP 2100 series (mid-1960s), the original Data General Nova (1969), and DEC's PDP-11 (1970). DEC later added an optional diode matrix read-only memory for the PDP-11 that stored a bootstrap program of up to 32 words (64 bytes). It consisted of a printed circuit card, the M792, that plugged into the Unibus and held a 32 by 16 array of semiconductor diodes. With all 512 diodes in place, the memory contained all "one" bits; the card was programmed by cutting off each diode whose bit was to be "zero". DEC also sold versions of the card, the BM792-Yx series, pre-programmed for many standard input devices by simply omitting the unneeded diodes. Following the older approach, the earlier PDP-1 has a hardware loader, such that an operator need only push the "load" switch to instruct the paper tape reader to load a program directly into core memory. The Data General Supernova used front panel switches to cause the computer to automatically load instructions into memory from a device specified by the front panel's data switches, and then jump to loaded code; the Nova 800 and 1200 had a switch that loaded a program into main memory from a special read-only memory and jumped to it. A related example is based on a loader for a Nicolet Instrument Corporation minicomputer of the 1970s, using the paper tape reader-punch unit on a Teletype Model 33 ASR teleprinter. The bytes of its second-stage loader are read from paper tape in reverse order. The earliest microcomputers, such as the Altair 8800 (released first in 1975) and an even earlier, similar machine (based on the Intel 8008 CPU) had no bootstrapping hardware as such. When started, the CPU would see memory that would contain executable code containing only binary zeros—memory was cleared by resetting when powering up. The front panels of these machines carried toggle switches for entering addresses and data, one switch per bit of the computer memory word and address bus. Simple additions to the hardware permitted one memory location at a time to be loaded from those switches to store bootstrap code. Meanwhile, the CPU was kept from attempting to execute memory content. Once correctly loaded, the CPU was enabled to execute the bootstrapping code. This process was tedious and had to be error-free. 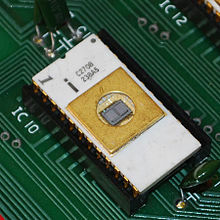 An Intel 2708 EPROM "chip" on a circuit board. The boot process for minicomputers and microcomputers[NB 5] was revolutionized by the introduction of integrated circuit read-only memory (ROM), with its many variants, including mask-programmed ROMs, programmable ROMs (PROM), erasable programmable ROMs (EPROM), and flash memory. These allowed firmware boot programs to be shipped installed on the computer. The introduction of an (external) ROM was in an Italian telephone switching elaborator, called "Gruppi Speciali", patented in 1975 by Alberto Ciaramella, a researcher at CSELT. Gruppi Speciali was, starting from 1975, a fully single-button machine booting into the operating system from a ROM memory composed from semiconductors, not from ferrite cores. Although the ROM device was not natively embedded in the computer of Gruppi Speciali, due to the design of the machine, it also allowed the single-button ROM booting in machines not designed for that (therefore, this "bootstrap device" was architecture-independent), e.g. the PDP-11. Storing the state of the machine after the switch-off was also in place, which was another critical feature in the telephone switching contest. Typically, every microprocessor will, after a reset or power-on condition, perform a start-up process that usually takes the form of "begin execution of the code that is found starting at a specific address" or "look for a multibyte code at a specific address and jump to the indicated location to begin execution". A system built using that microprocessor will have the permanent ROM occupying these special locations so that the system always begins operating without operator assistance. For example, Intel x86 processors always start by running the instructions beginning at F000:FFF0, while for the MOS 6502 processor, initialization begins by reading a two-byte vector address at $FFFD (MS byte) and $FFFC (LS byte) and jumping to that location to run the bootstrap code. Apple Inc.'s first computer, the Apple 1 introduced in 1976, featured PROM chips that eliminated the need for a front panel for the boot process (as was the case with the Altair 8800) in a commercial computer. According to Apple's ad announcing it "No More Switches, No More Lights ... the firmware in PROMS enables you to enter, display and debug programs (all in hex) from the keyboard." Some operating systems, most notably pre-1995 Macintosh systems from Apple, are so closely interwoven with their hardware that it is impossible to natively boot an operating system other than the standard one. This is the opposite extreme of the scenario using switches mentioned above; it is highly inflexible but relatively error-proof and foolproof as long as all hardware is working normally. A common solution in such situations is to design a boot loader that works as a program belonging to the standard OS that hijacks the system and loads the alternative OS. This technique was used by Apple for its A/UX Unix implementation and copied by various freeware operating systems and BeOS Personal Edition 5. Some machines, like the Atari ST microcomputer, were "instant-on", with the operating system executing from a ROM. Retrieval of the OS from secondary or tertiary store was thus eliminated as one of the characteristic operations for bootstrapping. To allow system customizations, accessories, and other support software to be loaded automatically, the Atari's floppy drive was read for additional components during the boot process. There was a timeout delay that provided time to manually insert a floppy as the system searched for the extra components. This could be avoided by inserting a blank disk. The Atari ST hardware was also designed so the cartridge slot could provide native program execution for gaming purposes as a holdover from Atari's legacy making electronic games; by inserting the Spectre GCR cartridge with the Macintosh system ROM in the game slot and turning the Atari on, it could "natively boot" the Macintosh operating system rather than Atari's own TOS. The IBM Personal Computer included ROM-based firmware called the BIOS; one of the functions of that firmware was to perform a power-on self test when the machine was powered up, and then to read software from a boot device and execute it. Firmware compatible with the BIOS on the IBM Personal Computer is used in IBM PC compatible computers. The Extensible Firmware Interface was developed by Intel, originally for Itanium-based machines, and later also used as an alternative to the BIOS in x86-based machines, including Apple Macs using Intel processors. Unix workstations originally had vendor-specific ROM-based firmware. Sun Microsystems later developed OpenBoot, later known as Open Firmware, which incorporated a Forth interpreter, with much of the firmware being written in Forth. It was standardized by the IEEE as IEEE standard 1275-1994; firmware that implements that standard was used in PowerPC-based Macs and some other PowerPC-based machines, as well as Sun's own SPARC-based computers. The Advanced RISC Computing specification defined another firmware standard, which was implemented on some MIPS-based and Alpha-based machines and the SGI Visual Workstation x86-based workstations. When a computer is turned off, its software‍—‌including operating systems, application code, and data‍—‌remains stored on non-volatile memory. When the computer is powered on, it typically does not have an operating system or its loader in random-access memory (RAM). The computer first executes a relatively small program stored in read-only memory (ROM) along with a small amount of needed data, to access the nonvolatile device or devices from which the operating system programs and data can be loaded into RAM. The small program that starts this sequence is known as a bootstrap loader, bootstrap or boot loader. This small program's only job is to load other data and programs which are then executed from RAM. Often, multiple-stage boot loaders are used, during which several programs of increasing complexity load one after the other in a process of chain loading. Some computer systems, upon receiving a boot signal from a human operator or a peripheral device, may load a very small number of fixed instructions into memory at a specific location, initialize at least one CPU, and then point the CPU to the instructions and start their execution. These instructions typically start an input operation from some peripheral device (which may be switch-selectable by the operator). Other systems may send hardware commands directly to peripheral devices or I/O controllers that cause an extremely simple input operation (such as "read sector zero of the system device into memory starting at location 1000") to be carried out, effectively loading a small number of boot loader instructions into memory; a completion signal from the I/O device may then be used to start execution of the instructions by the CPU. Smaller computers often use less flexible but more automatic boot loader mechanisms to ensure that the computer starts quickly and with a predetermined software configuration. In many desktop computers, for example, the bootstrapping process begins with the CPU executing software contained in ROM (for example, the BIOS of an IBM PC) at a predefined address (some CPUs, including the Intel x86 series are designed to execute this software after reset without outside help). This software contains rudimentary functionality to search for devices eligible to participate in booting, and load a small program from a special section (most commonly the boot sector) of the most promising device, typically starting at a fixed entry point such as the start of the sector. Boot loaders may face peculiar constraints, especially in size; for instance, on the IBM PC and compatibles, a boot sector should typically work in only 32 KB (later relaxed to 64 KB) of system memory and not use instructions not supported by the original 8088/8086 processors. The first stage of PC boot loaders (FSBL, first-stage boot loader) located on fixed disks and removable drives must fit into the first 446 bytes of the Master Boot Record in order to leave room for the default 64-byte partition table with four partition entries and the two-byte boot signature, which the BIOS requires for a proper boot loader — or even less, when additional features like more than four partition entries (up to 16 with 16 bytes each), a disk signature (6 bytes), a disk timestamp (6 bytes), an Advanced Active Partition (18 bytes) or special multi-boot loaders have to be supported as well in some environments. In floppy and superfloppy Volume Boot Records, up to 59 bytes are occupied for the Extended BIOS Parameter Block on FAT12 and FAT16 volumes since DOS 4.0, whereas the FAT32 EBPB introduced with DOS 7.1 requires even 71 bytes, leaving only 441 bytes for the boot loader when assuming a sector size of 512 bytes. Microsoft boot sectors therefore traditionally imposed certain restrictions on the boot process, for example, the boot file had to be located at a fixed position in the root directory of the file system and stored as consecutive sectors, conditions taken care of by the SYS command and slightly relaxed in later versions of DOS. The boot loader was then able to load the first three sectors of the file into memory, which happened to contain another embedded boot loader able to load the remainder of the file into memory. When they added LBA and FAT32 support, they even switched to a two-sector boot loader using 386 instructions. At the same time other vendors managed to squeeze much more functionality into a single boot sector without relaxing the original constraints on the only minimal available memory and processor support. For example, DR-DOS boot sectors are able to locate the boot file in the FAT12, FAT16 and FAT32 file system, and load it into memory as a whole via CHS or LBA, even if the file is not stored in a fixed location and in consecutive sectors. Examples of first-stage bootloaders include coreboot, Libreboot and Das U-Boot. Second-stage boot loaders, such as GNU GRUB, BOOTMGR, Syslinux, NTLDR or BootX, are not themselves operating systems, but are able to load an operating system properly and transfer execution to it; the operating system subsequently initializes itself and may load extra device drivers. The second-stage boot loader does not need drivers for its own operation, but may instead use generic storage access methods provided by system firmware such as the BIOS or Open Firmware, though typically with restricted hardware functionality and lower performance. Many boot loaders (like GNU GRUB, Windows's BOOTMGR, and Windows NT/2000/XP's NTLDR) can be configured to give the user multiple booting choices. These choices can include different operating systems (for dual or multi-booting from different partitions or drives), different versions of the same operating system (in case a new version has unexpected problems), different operating system loading options (e.g., booting into a rescue or safe mode), and some standalone programs that can function without an operating system, such as memory testers (e.g., memtest86+), a basic shell (as in GNU GRUB), or even games (see List of PC Booter games). Some boot loaders can also load other boot loaders; for example, GRUB loads BOOTMGR instead of loading Windows directly. Usually a default choice is preselected with a time delay during which a user can press a key to change the choice; after this delay, the default choice is automatically run so normal booting can occur without interaction. The boot process can be considered complete when the computer is ready to interact with the user, or the operating system is capable of running system programs or application programs. Many embedded systems must boot immediately. For example, waiting a minute for a digital television or a GPS navigation device to start is generally unacceptable. Therefore, such devices have software systems in ROM or flash memory so the device can begin functioning immediately; little or no loading is necessary, because the loading can be precomputed and stored on the ROM when the device is made. Large and complex systems may have boot procedures that proceed in multiple phases until finally the operating system and other programs are loaded and ready to execute. Because operating systems are designed as if they never start or stop, a boot loader might load the operating system, configure itself as a mere process within that system, and then irrevocably transfer control to the operating system. The boot loader then terminates normally as any other process would. Most computers are also capable of booting over a computer network. In this scenario, the operating system is stored on the disk of a server, and certain parts of it are transferred to the client using a simple protocol such as the Trivial File Transfer Protocol (TFTP). After these parts have been transferred, the operating system takes over the control of the booting process. As with the second-stage boot loader, network booting begins by using generic network access methods provided by the network interface's boot ROM, which typically contains a Preboot Execution Environment (PXE) image. No drivers are required, but the system functionality is limited until the operating system kernel and drivers are transferred and started. As a result, once the ROM-based booting has completed it is entirely possible to network boot into an operating system that itself does not have the ability to use the network interface. The boot device is the device from which the operating system is loaded. A modern PC's UEFI or BIOS firmware supports booting from various devices, typically a local solid state drive or hard disk drive via the GPT or Master Boot Record (MBR) on such a drive or disk, an optical disc drive (using El Torito), a USB mass storage device (FTL-based flash drive, SD card, or multi-media card slot; hard disk drive, optical disc drive, etc. ), or a network interface card (using PXE). Older, less common BIOS-bootable devices include floppy disk drives, SCSI devices, Zip drives, and LS-120 drives. Typically, the firmware (UEFI or BIOS) will allow the user to configure a boot order. If the boot order is set to "first, the DVD drive; second, the hard disk drive", then the firmware will try to boot from the DVD drive, and if this fails (e.g. because there is no DVD in the drive), it will try to boot from the local hard disk drive. For example, on a PC with Windows XP installed on the hard drive, the user could set the boot order to the one given above, and then insert a Linux Live CD in order to try out Linux without having to install an operating system onto the hard drive. This is an example of dual booting, in which the user chooses which operating system to start after the computer has performed its Power-on self-test (POST). In this example of dual booting, the user chooses by inserting or removing the CD from the computer, but it is more common to choose which operating system to boot by selecting from a BIOS or UEFI boot menu, by using the computer keyboard; the boot menu is typically entered by pressing Delete or F11 keys during the POST. Several devices are available that enable the user to quick-boot into what is usually a variant of Linux for various simple tasks such as Internet access; examples are Splashtop and Latitude ON. Upon starting, an IBM-compatible personal computer's x86 CPU executes, in real mode, the instruction located at reset vector (the physical memory address FFFF0h on 16-bit x86 processors and FFFFFFF0h on 32-bit and 64-bit x86 processors), usually pointing to the firmware (UEFI or BIOS) entry point inside the ROM. This memory location typically contains a jump instruction that transfers execution to the location of the firmware (UEFI or BIOS) start-up program. This program runs a power-on self-test (POST) to check and initialize required devices such as DRAM and the PCI bus (including running embedded ROMs). The most complicated step is setting up DRAM over SPI, made more difficult by the fact that at this point memory is very limited. After initializing required hardware, the firmware (UEFI or BIOS) goes through a pre-configured list of non-volatile storage devices ("boot device sequence") until it finds one that is bootable. A bootable MBR device is defined as one that can be read from, and where the last two bytes of the first sector contain the little-endian word AA55h, found as byte sequence 55h, AAh on disk (also known as the MBR boot signature), or where it is otherwise established that the code inside the sector is executable on x86 PCs. Once the BIOS has found a bootable device it loads the boot sector to linear address 7C00h (usually segment:offset 0000h:7C00h, but some BIOSes erroneously use 07C0h:0000h) and transfers execution to the boot code. In the case of a hard disk, this is referred to as the Master Boot Record (MBR) and is by definition not operating-system specific. The conventional MBR code checks the MBR's partition table for a partition set as bootable (the one with active flag set). If an active partition is found, the MBR code loads the boot sector code from that partition, known as Volume Boot Record (VBR), and executes it. The VBR is often operating-system specific; however, in most operating systems its main function is to load and execute the operating system kernel, which continues startup. If there is no active partition, or the active partition's boot sector is invalid, the MBR may load a secondary boot loader which will select a partition (often via user input) and load its boot sector, which usually loads the corresponding operating system kernel. In some cases, the MBR may also attempt to load secondary boot loaders before trying to boot the active partition. If all else fails, it should issue an INT 18h BIOS interrupt call (followed by an INT 19h just in case INT 18h would return) in order to give back control to the BIOS, which would then attempt to boot off other devices, attempt a remote boot via network or invoke ROM BASIC. Some modern CPUs and microcontrollers (for example, TI OMAP) or sometimes even DSPs may have boot ROM with boot code integrated directly into their silicon, so such a processor could perform quite a sophisticated boot sequence on its own and load boot programs from various sources like NAND flash, SD or MMC card and so on. It is difficult to hardwire all the required logic for handling such devices, so an integrated boot ROM is used instead in such scenarios. Boot ROM usage enables more flexible boot sequences than hardwired logic could provide. For example, the boot ROM could try to perform boot from multiple boot sources. Also, a boot ROM is often able to load a boot loader or diagnostic program via serial interfaces like UART, SPI, USB and so on. This feature is often used for system recovery purposes when for some reasons usual boot software in non-volatile memory got erased, and it could also be used for initial non-volatile memory programming when there is clean non-volatile memory installed and hence no software available in the system yet. Some embedded system designs may also include an intermediary boot sequence step in form of additional code that gets loaded into system RAM by the integrated boot ROM. Additional code loaded that way usually serves as a way for overcoming platform limitations, such as small amounts of RAM, so a dedicated primary boot loader, such as Das U-Boot, can be loaded as the next step in system's boot sequence. The additional code and boot sequence step are usually referred to as secondary program loader (SPL). It is also possible to take control of a system by using a hardware debug interface such as JTAG. Such an interface may be used to write the boot loader program into bootable non-volatile memory (e.g. flash) by instructing the processor core to perform the necessary actions to program non-volatile memory. Alternatively, the debug interface may be used to upload some diagnostic or boot code into RAM, and then to start the processor core and instruct it to execute the uploaded code. This allows, for example, the recovery of embedded systems where no software remains on any supported boot device, and where the processor does not have any integrated boot ROM. JTAG is a standard and popular interface; many CPUs, microcontrollers and other devices are manufactured with JTAG interfaces (as of 2009). Some microcontrollers provide special hardware interfaces which cannot be used to take arbitrary control of a system or directly run code, but instead they allow the insertion of boot code into bootable non-volatile memory (like flash memory) via simple protocols. Then at the manufacturing phase, such interfaces are used to inject boot code (and possibly other code) into non-volatile memory. After system reset, the microcontroller begins to execute code programmed into its non-volatile memory, just like usual processors are using ROMs for booting. Most notably this technique is used by Atmel AVR microcontrollers, and by others as well. In many cases such interfaces are implemented by hardwired logic. In other cases such interfaces could be created by software running in integrated on-chip boot ROM from GPIO pins. In case of DSPs there is often a second microprocessor or microcontroller present in the system design, and this is responsible for overall system behavior, interrupt handling, dealing with external events, user interface, etc. while the DSP is dedicated to signal processing tasks only. In such systems the DSP could be booted by another processor which is sometimes referred as the host processor (giving name to a Host Port). Such a processor is also sometimes referred as the master, since it usually boots first from its own memories and then controls overall system behavior, including booting of the DSP, and then further controlling the DSP's behavior. The DSP often lacks its own boot memories and relies on the host processor to supply the required code instead. The most notable systems with such a design are cell phones, modems, audio and video players and so on, where a DSP and a CPU/microcontroller are co-existing. Many FPGA chips load their configuration from an external serial EEPROM ("configuration ROM") on power-up. ^ UU was often of the form Uu, U=Control unit address, u=Device address, but some control units attached only 8 devices; some attached more than 16. Indeed, the 3830 DASD controller offered 32-drive-addressing as an option. ^ Only the S/360 used the 2250; the 360/85, 370/165 and 370/168 used a keyboard/display device compatible with nothing else. ^ "Pull oneself up by bootstraps - Idioms by The Free Dictionary". TheFreeDictionary.com. Retrieved 8 September 2015. ^ "Bootstrap Definition". techterms.com. Retrieved 2018-10-16. ^ Campbell-Kelly, Martin (1980). "Programming the EDSAC". IEEE Annals of the History of Computing. 2 (1): 7–36. ^ Wilkes, Maurice V.; Wheeler, David J.; Gill, Stanley (1951). The Preparation of Programs for an Electronic Digital Computer. Addison-Wesley. ^ Buchholz, Werner (1953). "The System Design of the IBM Type 701 Computer" (PDF). Proceedings of the I.R.E. 41 (10): 1273. ^ a b "IBM 7619 Exchange". Reference Manual 7030 Data Processing System (PDF). IBM. August 1961. pp. 125–127. A22-6530-2. ^ Principles of Operation Type 701 And Associated Equipment (PDF). IBM. 1953. p. 26. Retrieved November 9, 2012. ^ 650 magnetic drum data-processing machine manual of operation (PDF). IBM. 1955. pp. 49, 53–54. ^ GE-645 System Manual (PDF). General Electric. January 1968. Retrieved December 21, 2017. ^ PDP-10 System Reference Manual, Part 1 (PDF). Digital Equipment Corporation. 1969. pp. 2–72. Retrieved November 9, 2012. ^ a b z/Architecture Principles of Operation (PDF). IBM. September 2005. Chapter 17. Retrieved 2007-04-14. ^ PDP-11 Peripherals Handbook (PDF). Digital Equipment Corporation. 1976. pp. 4–25. ^ How To Use The Nova Computers (PDF). Data General. October 1974. section 2.8 "Program Loading". ^ Alberto Ciaramella racconta il brevetto del boostrap dei computer concepito in CSELT [Alberto Ciaramella discusses the patent for bootstrapping computers conceived at CSELT] (in Italian). ^ Adam Osborne; Gerry Kane. Osborne 16-Bbit Microprocessor Handbook (PDF). pp. 5–27. ISBN 0-931988-43-8. ^ Intel® 64 and IA-32 Architectures Software Developer’s Manual Volume 3 (3A, 3B, 3C & 3D): System Programming Guide (PDF). ^ Adam Osborne; Gerry Kane. Osborne 4&8-Bit Microprocessor Handbook. pp. 10–20. ISBN 0-931988-42-X. ^ Masahiko Sakamoto (May 13, 2010). "Why BIOS loads MBR into 7C00h in x86?". Glamenv-Septzen.net. Retrieved 2012-08-22. ^ a b Compaq Computer Corporation; Phoenix Technologies Ltd; Intel Corporation (January 11, 1996). "BIOS Boot Specification 1.01" (PDF). Retrieved December 21, 2017. ^ "Chapter 6 - Troubleshooting Startup and Disk Problems". Windows NT Server Resource Kit. Microsoft. Archived from the original on May 15, 2007. ^ "Tint". coreboot. Retrieved 20 November 2010. ^ Brown, Eric (2008-10-02). "MontaVista Linux drives Dell's quick-boot feature". linuxdevices.com. Retrieved 20 November 2010. ^ Larabel, Michael (June 14, 2008). "SplashTop Linux On HP, Dell Notebooks?". Phoronix. Retrieved 20 November 2010. ^ "Voodoo Envy's Instant-On IOS (powered by Splashtop)". YouTube. Retrieved 20 November 2010. ^ "iAPX 286 Programmer's Reference Manual" (PDF). Intel. 1983. Section 5.3 SYSTEM INITIALIZATION, p. 5-7. Retrieved November 5, 2016. Since the CS register contains F000 (thus specifying a code segment starting at physical address F0000) and the instruction pointer contains FFF0, the processor will execute its first instruction at physical address FFFF0H. ^ "80386 Programmer's Reference Manual" (PDF). Intel. 1986. Section 10.2.3 First Instructions, p. 10-3. Retrieved November 3, 2013. After RESET, address lines A31-20 are automatically asserted for instruction fetches. This fact, together with the initial values of CS:IP, causes instruction execution to begin at physical address FFFFFFF0H. ^ "Intel® 64 and IA-32 Architectures Software Developer's Manual" (PDF). Intel Corporation. May 2012. Section 9.1.4 First Instruction Executed, p. 2611. Retrieved August 23, 2012. The first instruction that is fetched and executed following a hardware reset is located at physical address FFFFFFF0h. This address is 16 bytes below the processor’s uppermost physical address. The EPROM containing the software-initialization code must be located at this address. ^ "Intel Platform Innovation Framework for EFI". Intel. Retrieved 2008-01-07. ^ "OpenBIOS - coreboot". coreboot.org. Retrieved 2013-03-20. ^ "Overview – The four bootloader stages". ti.com. Texas Instruments. December 5, 2013. Retrieved January 25, 2015. Look up bootup in Wiktionary, the free dictionary.